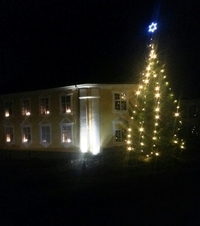 A Christmas tree and decorated lights illuminate the historical site around the former Peterson factory in Moss the 17th December 2013. Also colourful Christmas light arrangements in residential neighborhoods in Moss. The inhabitants here take the Christmas celebration seriously as rest of the people in Norway. Some houses are outlined in Christmas lights. The yellow building, Konvensjonsgården or Verket nr. 1 as the building also was called, was the administration building at Moss Jernverk. The red old workers' houses on the eastern side of what once was the main road between Christiania and the Swedish border are among the few buildings still left after Moss Jernverk. There is nothing else that creates more Christmas atmosphere outdoors than decorated lights and streets covered by snow. It`s a really good Christmas atmosphere here in contrast with the dark autumn season. It has been strong winds and heavy rain the previous weeks. The snow that fell in November is gone, but we still hope for some snow fall soon. Watch more Christmas photos from Moss on Moss Norway Travel Guide on Facebook.